Shop Moschino in the Amazon Outlet at huge discounts!. Shop MOSCHINO at up to 70% off in the Yoox designer outlet! View 1 outlet store where you can buy Moschino. Take up to 75% discount on men, women, and kid's apparel at the Multibrand Designer Clearance Sale. Brands included are Prada, A.G. Spalding & Bros., Armani, Aspinal of London, Sophie Hulme, Balenciaga, Dolce & Gabbana, John Galliano, Moschino, Roberto Cavalli, Givenchy, Valentino, and Versace. Shop for men and women's apparel and accessories at reduced prices at The One and Only Designer Sale. Brands included are Céline, Vivienne Westwood, Blumarine, Dolce & Gabbana, John Richmond, Moschino, Prada, Les 100 Ciels, Osman, Punto, Saint Laurent, and Gucci. 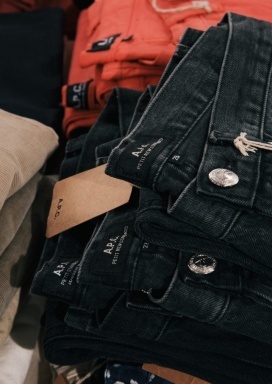 Shop for apparel, bags, accessories, and footwear for men and women at reduced prices at the One and Only Designer Sale. Brands included are Gucci, Céline, Burberry, Moschino, Chloé, Saint Laurent, Les 100 Ciels, Dolce & Gabbana, Philipp Plein, Osman, Balenciaga, Vivienne Westwood, Max Mara, Hugo Boss, Jane Carr, Alexander McQueen, and Sharon Wauchob. For one week only, Walkabout Foundation is taking over 123 Sydney Street to offer you guilt-free shopping for a great cause! 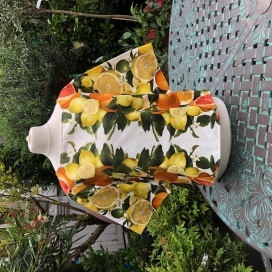 Drop in to buy pre-loved designer and vintage pieces at amazing prices, with proceeds going to Walkabout Foundation, who provide wheelchairs and rehabilitation in the developing world and fund research to find a cure for paralysis. 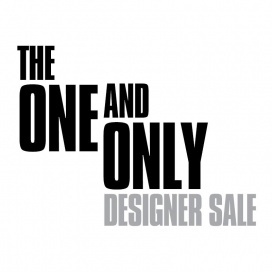 Shop for men and women's apparel, bags, accessories, and footwear at reduced prices at the One and Only Designer Sale. Brands included are Dolce & Gabbana, Gucci, Chloe, Hugo Boss, Celine, Balenciaga, Vivienne Westwood, Moschino, Alexander McQueen, Sharon Wauchob, Max Mara, Les 100 Ciels, Jane Carr, Osman, Burberry, Saint Laurent, and Philipp Plein. Shop for leather jackets, scarves, handbags, and accessories at reduced prices at The One and Only Designer Sale. Designer brands included are Prada, Moschino, Les 100 Ciels, Gushlow & Cole, Saint Laurent, Osman Studios, Mayrafedene, Chanel, and John Richmond. The One & Only Sale - Spring Edition will feature sunglasses, handbags, t-shirts, accessories, dresses, hats, and separates at reduced prices. Featured brands are Moschino, D&G, Versace, Gucci, Fendi, Prada, Alexander Mcqueen, and Vivienne Westwood. Shop for designer items by Chanel, Moschino, Dolce & Gabbana, Prada, Saint Laurent, and Vivienne Westwood items at discounted prices at event. VIP Entrance: 11:00 a.m. to 12:00 p.m. Buy tickets through this link: . General entrance by invite: 12:00 p.m. to 7:00 p.m. Download the invite here: . will feature footwear, men and women apparel, and accessories at reduced prices. Featured designers include Celine, Moschino, Chanel, D&C, Prada, Saint Laurent, Vivienne Westwood, John Richmond, Osman, Punto, Blumarine, and Les 100 Ciels. 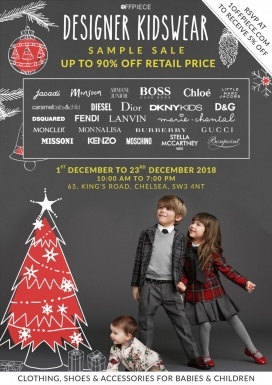 The One & Only Designer Sale offers a great venue for shoppers to find exciting deals on brands like Chanel, Dolce & Gabbana, Prada, Saint Laurent, Moschino, Celine, and Vivienne Westwood. 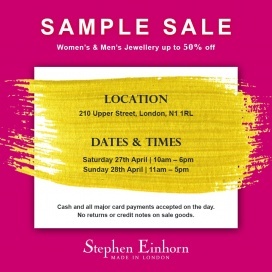 The sale will also feature fashion houses including Osman, Blumarine, John Richmond, Punto, and Les 100. Menswear, womenswear and accessories designer sales. 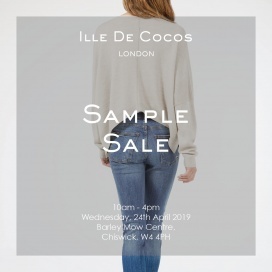 Womenswear and menswear designer sample sale! Book your free ticket ! Menswear and womenswear designer sales.